Do you feel like you know how to use AutoCAD Electrical, but still want to verify your designs have all the required information you need for the project? Did you forget to identify manufacturer information? Did you link child components to their parents? These are just a few concerns you may have. 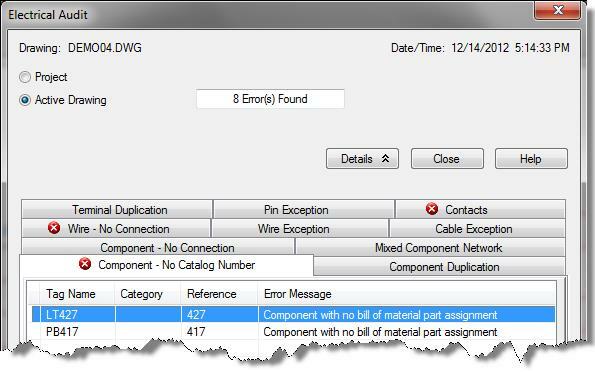 AutoCAD Electrical allows you to run reports like a bill of material, so you can order your parts for the project. However, if the information is not complete then some items will not be ordered. You may think the only way to verify your information is correct would be to search every component on every drawing, which is the reason it is often overlooked. The good news is AutoCAD Electrical comes with a utility that will search every drawing in the entire project and will generate a report on what needs to be addressed. After clicking the details button the issues are identified in a series of tabs. The tabs that have a red circle with a white X are the subjects that need to be corrected. You can click on the various tabs to see what needs to be corrected, but you do not need to close the dialog to use AutoCAD Electrical tools. If you wanted to see what issues are in another drawing you can use the next and previous drawing buttons to scan them. You can use the tools at the bottom of the dialog box to print the issues identified so you can correct them later. Additionally, you can select an issue from the list and use the Go To button to zoom in on the area of the drawing that has the issue. So if the was a component that doesn’t have catalog information you can select it as shown in the above image and then select the Go To button and AutoCAD Electrical will zoom in on the symbol. You can then right-click on the symbol and select Edit Component and add the required information. After using the Go To option an X will show up in the dialog to let you know you looked at this issue. To refresh the list so you can see what issues are left you will need to re-run the Electrical Audit tool. Knowing there is a tool that reports on issues on all the drawings in a project should allow you to create a project that is free of errors. A project free of issues will allow you to run accurate reports needed to physically create the projects you have designed.